Your feedback is important to us. 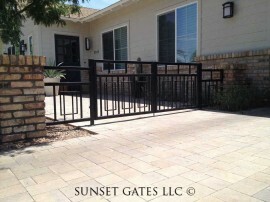 We are happy to answer any questions you may have regarding new or existing gates, fencing, or masonry. Send us a message and we'll be in touch! 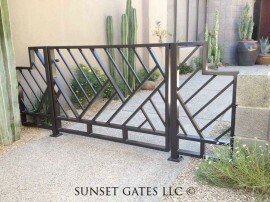 "The quote for the job that I received from Sunset Gates seemed very fair, especially in light of some of the other quotes that I had received. 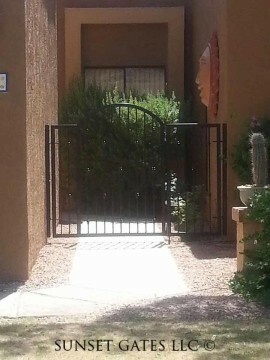 The gates turned out exactly how I wanted and look great. Shawn communicated the progress well with me and I found him to be very professional." "We met Shawn McPeters and the January home show in Phoenix . At the time he gave us a rough estimate. 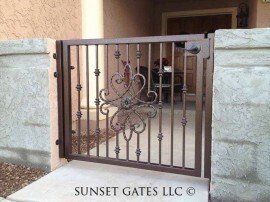 We contacted him the following week and followed up with an email detailing the type of gate we were interested in. The week after he came out to the location and did actual measurements and gave us a written proposal on Feb. 1, 2012. 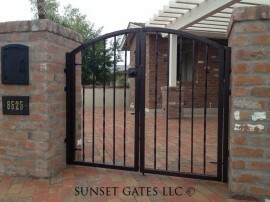 We agreed on the price, gave him a 33% deposit and the gate was completed and installed on Feb. 15, 2012. It looks great and we are very satisfied with the whole process." "This was a comfortable, easy, and impressive experience from start to finish! Shawn is extremely knowledgeable, professional and helpful while presenting options. The installation was also very professional, ending with quality workmanship and an impeccable clean-up. 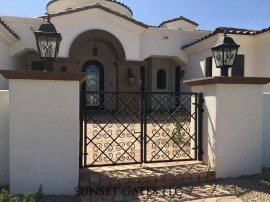 The wrought iron has a handsome, durable powder coat finish and the cedar woodgrain is beautiful with no stainless steel bolts showing when viewed from the front of the house. The privacy straps are an excellent addition, well worth the small added price. 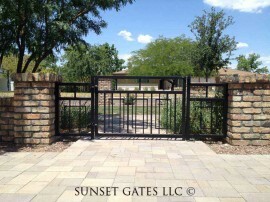 I highly recommend Sunset Gates!" 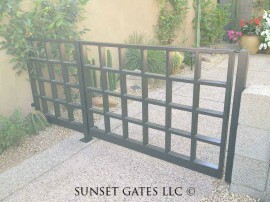 "I first had contact with Sunset Gates, Shawn McPeters by e-mail and he called me directly that same evening. He came to the house within a day to measure and go over options with us. He is a very personable young man and knows the business quite well. He let us know the work would probably be scheduled within two weeks and it was. We received a phone call setting up a date for the install and then another phone call that day letting us know they were on the way." 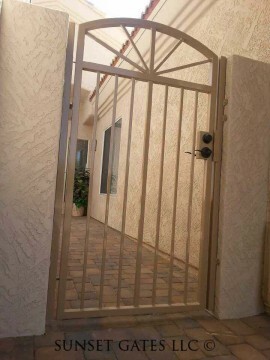 "I needed a new entry gate for my courtyard as well as a matching RV gate and side gate. Shawn was a delight to work with; professional, knowledgeable and understanding. He offered some great ideas and recommendations. He was very efficient and responsive. We worked together to come up with a unique design that carried though on all the gates. The gates were both beautiful and sturdy. He and his team showed up on time and were hard working and dedicated. They cleaned up and you never knew they were there, except for the gorgeous gates they installed. 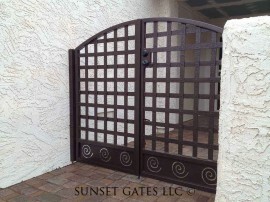 I would highly recommend Sunset Gates; good people and great gates."